The Scud missiles causing so much anxiety in the world today are Soviet designs that originated in a weapon developed by the Nazis. “Scud” is a Western term. The names of Soviet weapons we’re familiar with came from the Air Standards Coordinating Committee, a military group founded in 1948 by the United States, Great Britain, Canada, Australia, and New Zealand. The committee gave surface-to-surface missiles names starting with “S”—Shyster, Sandal, Skean, etc. The North Atlantic Treaty Organization later adopted the naming conventions, as did the Soviets, who were so secretive that they would often use the Western terms rather than utter the forbidden Russian names. During the cold war, NATO used “Scud” to refer to a specific missile, the R-11, a Soviet theater-range weapon intended to strike targets in Western Europe. Scuds were manufactured by the Votkinsk Machine Building Plant from 1959 to 1984. Today, however, “Scud” is like “Kleenex” and “Xerox,” brand names that are used to refer, generically, to all similar products. In this case, the product is any single-stage, storable-propellant military rocket with a range of between 186 and 372 miles. 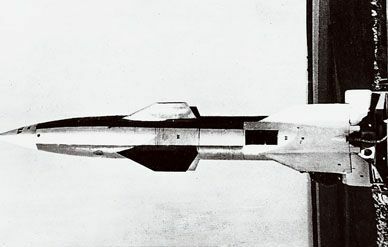 Scuds are often described as Soviet modernizations of the V-2, a surface-to-surface rocket that the Germans built during World War II. In fact, the Scud family was derived from a relative of the V-2, the Wasserfall, a radio-directed anti-aircraft missile that rocket pioneer Wernher von Braun and his team first tested in the German town of Peenemünde in 1944. Olaf Przybilski of the Technical University of Dresden discovered this link a few years ago when he interviewed German rocket engineers that the Soviets had conscripted to work for them after the war. What distinguished the Wasserfall from similar weapons was its oxidizer: nitric acid. Unlike liquid oxygen, the oxidizer used by the V-2, nitric acid can be stored at normal temperatures inside a rocket for long periods—essential for an anti-aircraft missile, which needs to be ready to fire on a moment’s notice. In the late 1940s, the Soviet air defense force cloned the Wasserfall and called its version the R-101. The Soviet army soon realized storable propellants offered the same benefit, shorter prep time for launch, for surface-to-surface missiles. Soon engineers drew on the R-101 to design the R-11 ballistic missile—the Scud. The die was cast. A few years later, the Soviets designed a successor to the R-11, the R-17. With a more powerful motor and more potent propellants, it had more than twice the range (186 miles versus 80). Western military services did not know the R-17 was really a new design so they called it the Scud-B. During the 1960s and 1970s, the Soviets exported Scud-Bs, which were often an inexpensive substitute for an air force, to their Warsaw Pact allies and to clients in the developing world. South Yemen was one example. The Scud-B’s extended range gave South Yemen the ability to hit Sanaa, capital of North Yemen, its perennial rival. The R-17 not only became the most proliferated ballistic missile in history, it also inspired more derivative designs than any other. But even today, Wasserfall DNA appears in the Scud and in all of its progeny: They all have the same 35-inch diameter as the original. The event that spread Scud technology around the world was the 1973 Israel-Egypt Yom Kippur War. As a sign of socialist solidarity, North Korea sent a few pilots to Egypt. After the war, Egyptian officials hoped its new Korean friends would get into the business of manufacturing replacement parts for the Egyptian army. (Egypt was equipped mainly with weapons from the Soviet Union, but relations between the two governments had soured.) So in 1976, Egypt shipped a few Scud-Bs to North Korea. The North Koreans reverse-engineered the missiles, and by the 1980s they were ready to build their own. It was largely this Egyptian-Korean connection that spawned the many Scud variants we see today. Western analysts called the Korean R-17 copy the Hwasong-5. Officials in Pyongyang quickly realized that sales of R-17 knock-offs might bring in badly needed hard currency. (Indeed, it was a derivative of the Hwasong-5 that the Spanish navy discovered on a North Korean freighter headed for Yemen last December.) North Korea found a ready customer in Iran, which in the 1980s was in the middle of a no-holds-barred war with Iraq. At this point, the R-17’s genealogy began to double back on itself. The Iraqis, as it happened, had their own Soviet-supplied Scud-Bs. After the Iranians hit Baghdad with a few dozen Hwasong-5s, the Iraqis wanted to retaliate. The Iranian city of Tehran, though, was much farther from the border than Baghdad. The Iraqis’ solution was to extend the range of their Scud-Bs by splicing additional sections into the propellant tanks and using a smaller (and therefore lighter) warhead. Iraq, whose leader apparently couldn’t miss a chance for self-promotion, dubbed the missile al-Hussein. It could deliver a one-ton warhead 370 miles, just far enough to reach the Iranian capital. During the winter of 1988, the two countries fired missiles at each other in what became known as the War of the Cities. All Scud-derived missiles are mainly terror weapons. Because their gyros and electronics date back to the 1950s, the missiles are notoriously inaccurate. The original R-17 had a circular error probable (CEP) of about 3,300 feet, meaning that half the missiles aimed at a target would land more than two-thirds of a mile away. This never mattered to the Soviets; since they planned to arm the missiles with nuclear or chemical warheads, most targets would still be in the lethal zone. Other countries used the imprecise Scud as a crude device for lobbing a ton or two of high explosives somewhere into an opponent’s cities. In 1988 Iraq fired about 500 al-Husseins at Tehran, killing 1,000 to 2,000 people. Yet the greater threat of Scuds has always been not what they are today, but what they can lead to tomorrow. After the War of the Cities, the North Koreans took a cue from the Iraqis and began a project to build a Scud derivative that was 50 percent bigger in each dimension. Western analysts labeled the rocket the No Dong (as with all North Korean rockets, the analysts simply named the missile after the town near where it was first spotted). Because the No Dong can hurl a one-ton warhead 930 miles, it can reach any part of South Korea and Japan. Pyongyang has exported No Dong missiles, components, and technology to Pakistan (where it is called the Ghauri 2) and Iran (the Shahab 3). North Korea reportedly is also developing missiles that combine No Dong and Hwasong components into multi-stage rockets. These missiles, the Taepo Dong series, could reach Alaska, Hawaii, and even parts of the continental United States.